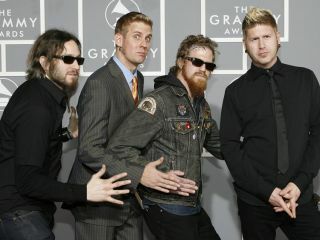 Mastodon in their natural setting...the Grammy Awards! Mastodon have just issued the above video trailer for their upcoming album, The Hunter. Although the clip is brief, it's enough to give us a good idea of what the song Black Tongue sounds like - and an insight into the overall vibe of the rest of the record: major progressive psychedelia! While it's easy to get lost in the mind-bending video images, the savage riffage of guitarists Brent Hinds and Bill Kelliher is pure audio Red Bull. It is said that Mastodon have dropped their trademark Byzantine storyline approach on The Hunter, but judging from this all-too-short sample, it's clear that their challenging, multi-layered prog-metal aesthetic remains. The album was recorded in Atlanta and Los Angeles with producer Mike Elizondo and will be released this fall.